We would never leave Android, but it doesn’t hurt to test out how thinks might have been if we were to choose another operating system. I must admit, Microsoft has done some pretty snazzy stuff by creating a Windows Phone 7 emulator – all within your phones browser. 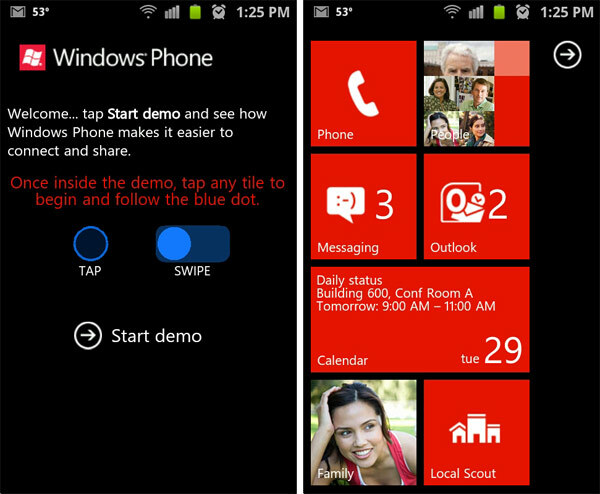 By visiting http://aka.ms/wpdemo, you will be prompted to start a guided tour through WP7. Your device will soon switch from Android to the Windows Phone 7 experience you see above. Every tile is functional and Microsoft has done an outstanding job with a unique marketing ploy. Additionally, at the end of the tour you have a chance to win a free Windows Phone 7 device – because they know, we all love free things.